The idea of Knut, the polar bear who died suddenly last month, being stuffed and put on display at the Berlin Zoo might seem a little creepy, but is it worth protesting over? While Knut fans have been campaigning for his remains to be treated in a more dignified way, others are mocking the controversy, saying it's ridiculous to mourn a zoo animal, particularly in light of recent human tragedies. "When someone dies in your family I think you don't want him stuffed in a museum ... Knut is not only a polar bear for people, he is a friend, a family member." 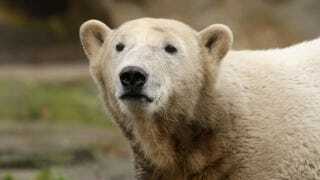 The zoo's director, Bernhard Blaszkiewitz, who made the decision on the fate of Knut's corpse, has a more cynical view. "The problem is, people take their human feelings and put them into animals," he says, adding that he's surprised people are leaving "silly presents" at the zoo, such as flowers and posters. "There are a lot of people who say, ‘How can you be so upset when so many people have died in Japan?' What do you know about how I feel about what happened in Japan? I'm grieving about a very special bear." It may be irrational, but many people connected to Knut as if he were a pet rather than a wild animal living in captivity.Blaszkiewitz may be making fun of mourners now, but for the past four years he encouraged people to form a bond with Knut, and the zoo profited. Before Knut's death the zoo registered "Knut" as a trademark and sold a wide variety of Knut merchandise, including plush toys and videos. People may generally value the lives of humans more than animals, but that doesn't mean they won't cry over the loss of a pet. Especially since Blaszkiewitz's career revolves around wildlife, it's unclear why he can't wrap his head around the idea that humans can form a bond with animals, and feel grief when they die.